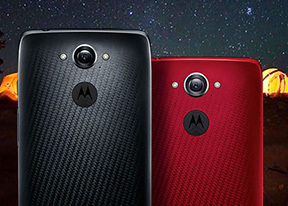 Motorola Droid Turbo for Verizon Wireless is the latest product of a long and prolific partnership between the storied manufacturer and the largest wireless carrier in the United States. Over the years, Motorola and Verizon have released a number of groundbreaking devices. They include the ultra-thin (for its time) Droid RAZR, through the RAZR MAXX, which had 3,300mAh battery back when 1,800mAh was standard, all the way to the Droid RAZR M that impressed with thin display bezels a year before anyone else. The Droid Turbo is reaching for the crown of the most capable Android smartphone to launch in 2014. Its specs leave no room for compromise - a Qualcomm Snapdragon 805 SoC, a 5.2" QHD AMOLED display, a 21MP camera, and a 3,900mAh battery come straight from the dreams of every Android junkie. The same goes for the device's innovative build materials that include Ballistic Nylon and DuPont Kevlar reinforced by Metallized Glass Fiber. As you can see, the Motorola Droid Turbo is anything but lacking in top shelf specs. As a matter of fact, the smartphone is arguably the best-equipped Android smartphone available at the moment - it blows competitors away with a combination of powerful internals, a humongous battery, and the sharpest display available at the moment. Forward thinking, water-repellent build materials meet the top-shelf specs of the device. Ballistic Nylon debuts on a smartphone, while DuPont Kevlar, a long time Motorola Droid landmark, has been further enhanced by the addition of a material called Metallized Glass Fiber. Of course, having such a long list of hardware specs has come at a price. Motorola Droid Turbo is noticeably thicker than the typical 2014 Android flagship. We will surely be keeping a close look on its handling and ergonomics. Will the Motorola Droid Turbo live up to the hefty expectations set by lengthy feature set? Read on to find out! As always, we will kick the review off with unboxing of the device, followed by a close look at its design and build.